Learn how astronomers “listen” to the sound of the stars, and then use that information to characterise with very high detail the planets around them. Throughout 2019, the International Astronomical Union (IAU), celebrates its 100 years of existence. The Noites no Observatório participate in this celebration joining, during the whole year, the many events and projects happening all over the world. 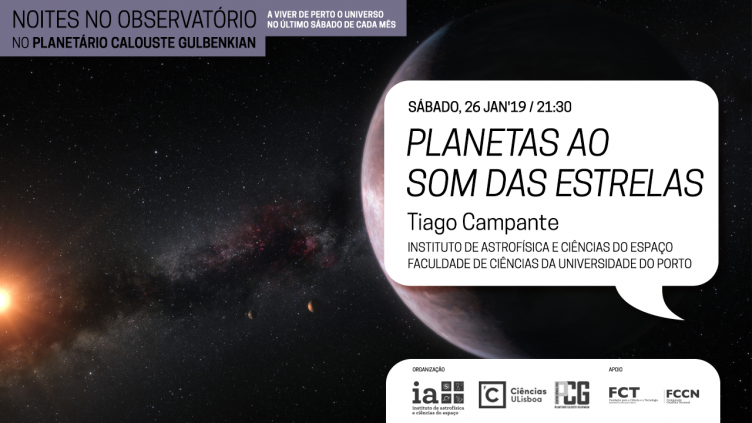 Noites no Observatório are organised by the Instituto de Astrofísica e Ciências do Espaço, in partnership with the Planetário Calouste Gulbenkian – Centro de Ciência Viva. The public talk is given in Portuguese. Observations of the night sky are available in English. Follow us on the IA facebook page, twitter feed or subscribe to our newsletter (in Portuguese).